As a family run business, we like to think that our oven cleaning prices are low. We are not a franchise or agency with high overheads which mean that we can offer you some great deals on oven cleaning in the Kent area. Whether you want your Oven, hob or extractor fan cleaning our oven cleaning prices are some of the best around. Call us on 01634 799 712 and we'll give you an instant price for cleaning your oven without any hidden extras! Our oven cleaning prices are competitive! Give us a call on 01634 799 712 and we will be happy to give you a fully inclusive oven cleaning price instantly. Alternatively contact us online and we'll call you back to discuss your requirements. You can be assured that our Oven cleaning prices will be amongst the most affordable in the Kent area. Get a oven cleaning quote online or call 01634 799 712 for an instant quote over the phone. If you need professional, fully insured, reliable oven cleaner in the Kent & Medway area including Maidstone Kingshill Aylesford Dartford Gravesend Rochester Chatham Gillingham Rainham Strood Walderslade St Marys Island Wigmore Hempstead Cliffe. 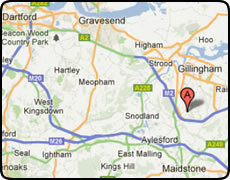 Contact Oven Renew Oven cleaning Medway Kent.